How Does the Apple Watch Series 2 Compare to the Original? When the Apple Watch Series 2 was announced, it didn’t sound like that big of an upgrade to me from the original watch. I bought it anyway, mostly because Steve wanted to get a new one, and I had the dreaded FOMO (Fear of Missing Out). Now that I’ve had it for a week, I thought it would be interesting to walk through the features of the Series 2 to see whether there’s enough there to make you want to upgrade from the original (Series 0) Apple Watch. The Series 2 has what they’re calling a second generation OLED Retina Display. Even though it has the same screen resolution, it’s supposed to be 1000nits of brightness, which is more than double the 450 Nits of the Series 0. This did sound pretty good to me, as I have a heck of a time seeing my watch screen in broad daylight. It’s especially hard as I have to wear sunglasses, because I can’t see the watch without them. I put the two watches on my wrist and tried to take a photo of them both at the same time. I tried to get them at the same angle in the sunlight to see if the difference was really as perceptible as the 2X brightness numbers would suggest. I hope you appreciate the trouble I go to for you guys. The only way I could do this was to set the focus and exposure by using my NOSE on my iPhone’s camera! That was entertaining and all but I eventually enlisted Steve to help me take a good photo to capture the difference. While the Series 2 is noticeably brighter than the Series 0, I don’t see a 2x improvement, but maybe more like 50% brighter. The Series 2 has a built-in GPS, while the original Apple Watch must rely on the GPS in the iPhone. This matters if you want to track your location and not carry your phone with you. Personally I never go anywhere without my phone because I like to get notifications, I like to be able to take photos and on really rare occasions I actually get phone calls on my iPhone. And then there was the time I was simply walking in the neighborhood when I tripped and smacked my head on the concrete and I was pretty glad to have my phone with me to immediately call Steve. I don’t know that I’m representative of most users because people were clamoring for GPS. The amazing thing is that Apple says that the new Series 2 watch has the same 18 hour battery life as the original Apple Watch even with that built-in GPS. If you care about swimming, you care deeply that the Series 2 Apple Watch is now water resistant to 50m depth. Normal people would refer to that as waterproof, but these things have technical definitions so we’ll call it water resistant. They explained on stage during the announcement that it’s really hard to make something water resistant that has a speaker in it. Let’s talk for a moment about how speakers actually work to explain why it’s so difficult. Speakers use a basic principle of electro-magnetics. If you take a coil of wire, and place a cylindrical magnet inside the coil and then pass electricity through the wire, the current causes an electromagnetic field which will actually move the magnet. Interestingly enough it works the other way around as well. You can move the magnet and cause current to flow through the wire. Pretty cool stuff. This is the principle on which speakers work. They have a coil of wire through which electricity is passed. When the magnet inside the coil moves, it in turn pushes a diaphragm, which in turn moves air, which creates the sound waves you can hear. That very last step is critical. Without being able to move the air, a traditional speaker can’t make sound waves. So if the speaker on the Apple Watch is exposed through the hole in the side, and the watch can go under water, how does that work? The trick they decided to use was to have the speaker actually squirt the water out of itself to clear diaphragm so it can move the air and provide audio again. Makes sense from what we just learned, right? You can put current through the wire, move the magnet which moves the diaphragm and pushes the water out of the hole. I’m not sure they invented this idea but it’s a great way to solve the problem. When I heard about this I wondered how this would work. Would it squirt the water out every time you took your arm out of the water swimming? Or would it wait till the first time you did something that activated the speaker? Picture this, you’re in a meeting and you get a notification and your watch squirts water all over your business suit! Neither of these options seemed ideal. Of course Apple thought of something better. When you start a swimming workout, your watch will automatically go into what they call water lock mode. You’l see a blue water droplet at the top of the screen. 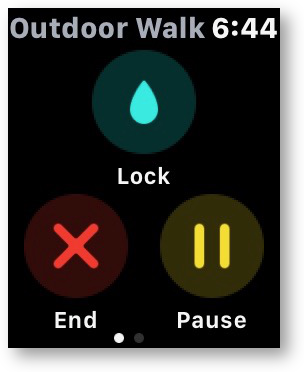 If you’re going to go outside in the rain, you can manually turn on the water lock mode. You can swipe up from the bottom of the screen and tap the blue water droplet, or swipe from left to right to the pause/stop screen to set the water lock button. 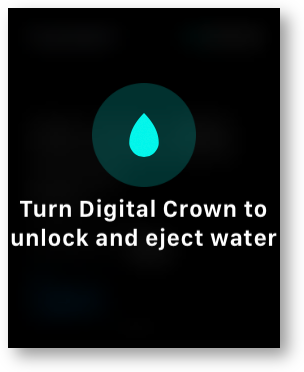 When you’re ready to eject the water, simply turn the digital crown. The screen will animate delightfully with blue water droplets as a little sound plays. I tried dunking my watch and then turning the crown to get it to squirt, but I couldn’t see it. I’ll keep trying, though, you know, for science! Ok, we’d better move on but I thought the way they handled the water problem was pretty cool. Something I haven’t heard talked about is that the new Series 2 watch is actually 9% thicker and 13% heavier than the original Apple Watch. I have to say that it’s not at all noticeable, since that translates to only 0.9mm thicker and 3.2 grams heavier. Maybe that’s why nobody’s talking about it. Apple made a big deal about how they put a dual core processor S2 in the new Series 2 watch (and in the new Series 1). In theory that would make the watch a lot faster. Just like the changes with iOS 10 made older phones perform better, watchOS 3 makes the older Apple Watch work faster as well. I hadn’t noticed a speed improvement, so it was time to run some tests. I opened a whole bunch of apps on both watches at the same time. Five of them opened at the same time on each watch, three opened faster on the new watch, and three opened faster on the old watch. One, an app called Just Press Record, opened WAY faster on the old watch. As of right now I wouldn’t buy the new watch for the speed. I’m guessing though that app developers have not yet written their code to take advantage of the dual processor chip by using multi-threading, so maybe things will get faster on the new watch over time. By the way if you think you’ll get Maps super quick on the new watch, think again. Unless you’re a swimmer or wanted GPS, I probably haven’t convinced any of you to upgrade your original Apple Watches to the Series 2, but I have one observation that might make you take the plunge. Remember Apple said that the new watch will still have an 18 hour battery life even though they added the GPS? Well, what if you don’t use the GPS but instead let the iPhone keep performing that function? Turns out you get significantly more battery life from the new watch. Battery life on the original watch might have been fine for you. However, if you exercise a lot while running the Workout app, those little green LEDs burn through battery like crazy. I work out about 90 minutes a day and several days a week my watch gives me the 10% battery level warning well before I’m ready for bed. It helpfully offers to go into battery saver mode at around 8pm. After I got the Series 2 watch, I noticed almost immediately that I was never getting that warning in the evenings. In fact, when I put it on the charger at night I was seeing battery levels in excess of 30% left! I decided I needed to empirically test out the difference in battery life on the two watches. Because I’m a scientist, I wore both watches for an entire day. My first observation is that it’s really annoying to wear two watches. Anyway, I checked battery life throughout the day and the older watch slipped 10% behind the Series 2 fairly quickly. 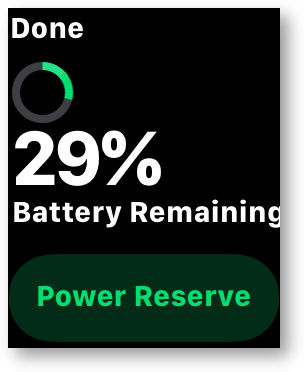 By the end of the day, the Series 2 battery was reporting 13% more battery than the original watch. This is huge to me. If you’re unhappy with the current battery life, this might be big for you too. In case you think I’m hallucinating, iFixit did a teardown of the Apple Watch Series 2, and found a 275mAh battery compared to the original Apple Watch at 205mAh. How Much Better is the iPhone 7 Plus Wide-Angle Camera Than the iPhone 6? Thanks for the review, Allison. For some reason, I usually don’t have enough reason to buy a first-generation new Apple device. I didn’t buy an iPhone until the 3GS, an iPad until version 2, and an Apple Watch until series 2. Usually the wait has been worth it for me. Interestingly, the two features that put the series 2 over the top for me were swim exercise tracking and the GPS. 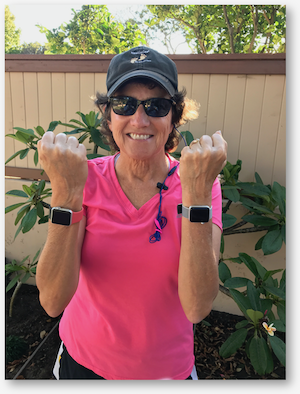 I do about equal amounts running and swimming for cardio exercise, and tracking only half with the original Apple Watch didn’t seem worth it. I just swam for the first time with my new series 2, and it worked really well. Interesting how it can track when you change directions in a pool to start a new length. I think it does that with accelerometers rather than the GPS, which may or may not work well in an indoor pool. The other thing for me was the ability to using a golfing app without needing my iPhone nearby. I do keep my iPhone in my golf bag, but I’m often separated by some distance from it while playing. Suffice it to say that my usual golf round often involves a wonderful walk or two in the woods. I didn’t have an original Apple Watch for comparison, as you did, but the series 2 meets my needs really well. As an aside, people can easily pay $200 or more for a golfing watch, but the Apple Watch throws in all the Apple stuff, so for me, it was a no-brainer. Excellent use case, for golfing George. I never thought about walking that far (intermittently) from your phone. I think you’ll get good battery life though because when you get out of the woods you’ll be back on phone GPS. On swimming does it record the turnaround as a segment? 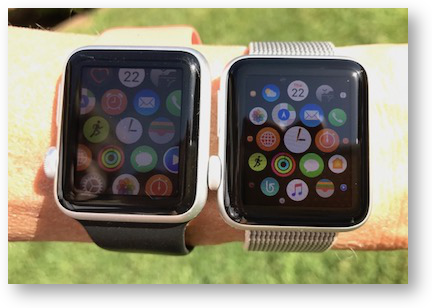 Ooh – and I wonder whether there are any golfing apps for iOS that have Apple Watch components? A well done review, Allison. Important metric? The “old” model is still available for $100 less? A lot of what Apple seems to be promoting, maybe this is because you’re interested in the metric-ification of your own life, is tracking your exercise. This was more helpful to me than most of the reviews I have been reading from CNET and other techie sources. You made the watch comparison exactly what I needed. I workout mostly on a treadmill indoors and I work indoors. The brightness and battery were my main concern as I venture into the smart watch arena. I have been debating buying a deeply discounted watch series 0 or the still cheaper series1. The 2 has more features and cost than I want or need. I think I’ll take the plunge on the cheaper watch and I can always upgrade and give that watch to a family member if I need more battery. Thanks for the note, Kari. I think you’ll be really happy with the Series 0 watch, especially with watchOS 3. Thank you for this review. Ad a techie I really appreciated your colorful review. I’m upgrading from the 0 (awful name) to the series 2 and am looking forward to getting that battery and brightness boost.